Thanks to all of you who studied Ephesians 6 with me over the past month! I have appreciated your fellowship, and I pray that God has used your time in the Word to change you and to draw you closer to Him. For those who are still working to finish the study (and I know there are many of you, because I always get carried away and make the lessons too long, especially at the end), don’t give up! Keep working! There’s no deadline you need to meet! Grab a friend, tell her you’re determined to finish up the study, and ask her to check on how you’re doing once in a while! Or share with us in the Facebook group that you’re determined to finish so we can be praying for you! Now it’s time for our end-of-the-study giveaway! This is for anyone who is reading this post! You don’t need to do the study to enter. And you don’t need to enter the giveaway at all, if you don’t want to! But we would really appreciate you taking the time to answer five survey questions that will help us serve you better in the future. We want to offer encouragement in the areas you need encouragement, and this survey will help us do that! 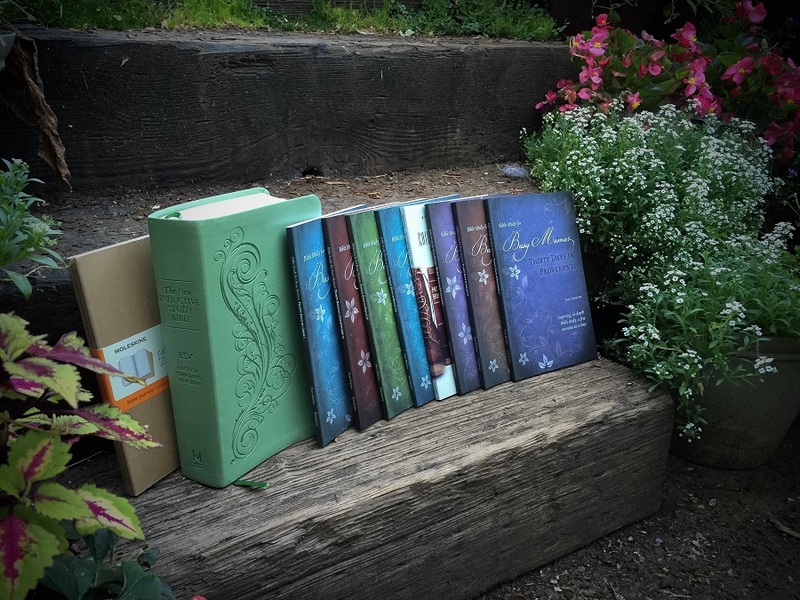 This time, we’re giving away a Bible study collection worth $169 (as pictured above). This set includes all eight of my “Busy Mamas” Bible study books, a pack of 3 Moleskine journals, and our favorite study Bible, the New Inductive Study Bible (Winner may choose ESV or NKJV translation, or a different study Bible of similar value). To enter the giveaway, just take the 5-question survey by August 18 and be sure to enter your email address at the end. Also, if you have any suggestions for ways to improve our online studies, feel free to leave a comment at the bottom of this post. I really value your input! Stay tuned for our regular weekly (hopefully 🙂 ) posts from now until we start our next online study in November! It would help if you only used one Bible translation to do the study. It is very confusing because they are all different. Preferably the one that actually says “study” in 2 Timothy 2:15. I have enjoyed this study very much! I haven’t completed the last 5 days because we have been out of town, but look forward to finishing next week. Thank you again for the time and effort it takes to put these out there. I think I am getting faster at using the BLB and Bible Study tools because this is my 3rd or 4th study and it was very quick and easy for me this time around. I am going to be using the children’s activities with my children when we begin school soon. Thank you again! Have been anxiously waiting to see who won! When will you post that?